Niveditha Naik, a software engineer, quit her job after working for three years at Infosys. She wasn't unhappy at work but family was a priority. "My husband was in the merchant navy and used to be out for months. Even when he was home, we hardly got time together, as com-muting to and from work took me four hours every day," says Naik. She quit her job in February 2008. Her daughter was born in July 2009 and her son in 2011. When her son turned one, in 2012, she was ready to go back to work. However, finding a job after the four-year break was difficult. "As soon as recruiters saw that I had taken a long break they would dis-count my application," says Naik. That she completed an MBA, through a distance learning pro-gramme, while bringing up her children didn't count. "A break is con-sidered a blotch in the and one has to be perseverant and ready to make compromises," says Rituparna Chakraborty, co-founder and senior VP, TeamLease Services. Naik did get job offers but none related to her core skills. Finally, she had to take up a sales job in the financial sector. "From day one, I felt overqualified. There was no comparison with the earlier work quality and culture," says Naik. She has quit again and will now wait for the right job . She is not sure how long it will take. "I had a strong start and had I not taken the break, companies would have wanted to hire me. I wouldn't have been considered irrelevant," she says. Whatever the reason-family, health or education-an applicant who has taken a career break makes recruiters apprehensive even if one manages to convince them about their ability. So, one must be prepared to explain the reasons for the break. Also, one must be ready to face questions such as-What if the problem resurfaces? Why do you want to join work now? What did you do during the break? "Most organisations are not equipped to handle job breaks. There is little in the name of coaching, mentorship and assessment," says Sairee Chahal, co-founder, fleximoms.com, which connects women to employers who offer flexitime options and runs a 'back to work' programme, Second Chance, for women with a career breaks. Why only women? "Because other than pursu-ing higher education or health reasons, men generally do not take long breaks," says Chahal. Most women need maternity break , and it is usually mothers who put careers on hold to take care of the children. Other reasons are marriage and relocation. "Though some men also attend our programme or are looking for flexi-career options, their number is small, 2% perhaps. It will take time for this ratio to change," says Chahal. The ratio may be skewed but the difficulties are same for both men and women. Rejoining will mean adjusting to a newer and more evolved marketplace of skills and stepping out of the comfort zone. Here are some ways to retain your employability during the break so that the comeback can be as smooth as possible. Before the HR manager puts this question to you, ask yourself: Why do I want to work again? Unless you are doing it for financial reasons, the first step should be a analyse of your decision to return to the workforce. Much would have changed since you left. At this stage, analyse what you are capable of handling. This is crucial if you had quit due to personal responsibilities. 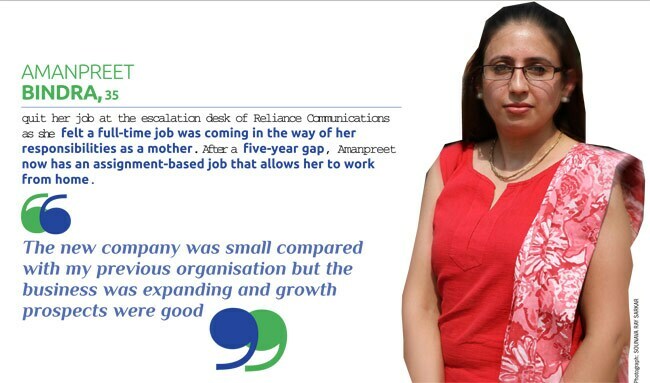 "If I had the option to work from home or flexible timings, I wouldn't have resigned," says Amanpreet Bindra, who left her job at Reliance Communications as she felt it was coming in the way of her responsibilities as a mother. She now works for an NGO from home. Also, assess your current interests. It is not necessary to return to the old role. You can use this stage to make a career shift. Gauri Bafna was consulting head, human resources, PwC, Jakarta, when she left the job to take care of her family. After 10 years, she wanted to work again, but not in the corporate world. So, she did a course in bakery and confectionery and turned a hobby into a business. "This is not for money. I'm pursuing a passion," says Bafna. At present, she runs Swetcentric from home and bakes on order. She plans to open an outlet soon. Bafna had to build from scratch. But it's not the only way. There are a range of options. For example, running a franchise or becoming part of a partner network or reseller programme can be easier than going solo. You can also work with start-ups that value your experience or be a consultant in your area of expertise. "Combine your experience with developments during the break to assess where you can fit in best," says Chakraborty of TeamLease. For instance, Bindra used her experience in the telecom industry with Reliance to work for an NGO, where flexible options is easier. Employers want people who are abreast of the latest trends related to work. Therefore, stay updated during the break. The traditional ways to brush up skills and knowledge, books, magazines and courses help. However, staying in the field through freelance work is best. "Rather than doing a course, if possible, take up part-time assignments," says Sunil Goel, MD, GlobalHunt India. One can also help a charity, work for NGOs, enhance digital skills or give a hand to startups. This will give the impression that you have used the break well. Keep in touch with old colleagues and employers. Networking will help you search for an appropriate opening or get good references that can increase your chances of getting selected in a job interview. A gap does not show well. But trying to cover it up makes it worse. So, explain the reasons clearly, either in the covering letter or a line in the resume. "Be clear in your communication. Most important, convey your sincerity and eagerness to take on the new assignment," says Chakraborty. Recruiters often check your digital footprint. "Align your profile on social and professional networks with your resume," says E Balaji, MD and CEO, Randstad India. If you do not have an account on these networks, make one. It will give you the option of explaining things in detail, which might not be possible in a two-page resume. You are at a disadvantage at this stage and, so, being flexible will help. Salary, for one, should not be a big deciding factor. "Companies always look at the last role and compensation. So, do not compare your pay cheque or job profile with those who started with you and have grown while you were on a sabbatical," says Goel of GlobalHunt India. This doesn't mean you should allow yourself to be treated as cheap labour. The compensation should be in keeping with your experience and industry standards. It is often easier to make a comeback in emerging high-growth sectors or smaller firms. Emphasis should be on job profile and prospects and not on the size of the organisation. "The company was small compared with my previous organisation but the business was expanding and growth prospects were good," says Bindra. Also, it is easier to get into roles that focus on individual skills and competence and not so much on ability to manage teams and organisational structures. "One has a higher probability of returning in teaching, programming and recruiting far more smoothly than a managerial or marketing role," says Chakraborty of TeamLease. However, it is incorrect to say that one cannot make a comeback in other professions. "One's ability to persevere, confidence and readiness to make adjustments to get back to work matter," she says.